Two constants in Gina’s law practice have always been prodigious energy and an ability to assess and deeply understand clients’ situations. Gina remains a trusted advisor to people who first called upon her 25 years ago. The same passion she brought to pursuing a legal career remains evident in her approach to resolving client matters. Gina had just earned a degree in international relations when she seized the opportunity to work with two state attorneys in Madison, Wisconsin. Adept at research, analysis and problem-solving, she played a significant role in drafting Wisconsin’s first residential landlord-tenant regulations. This experience motivated Gina to enroll in law school. Today, she runs practices both in intellectual property (IP) and credit union law. 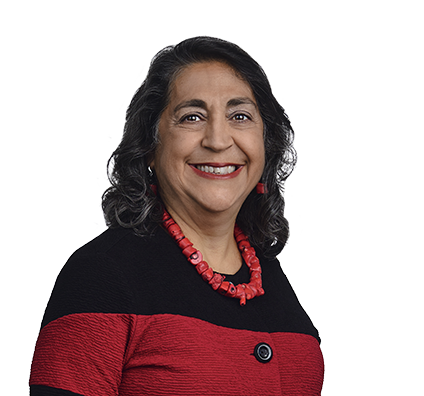 She advises financial services institutions, media and high-technology companies, and manufacturers on all aspects of IP and has litigated cases in federal courts across the country. Gina heads Husch Blackwell’s Credit Union team. Her credit union practice centers on all legal matters of interest to credit unions including vendor contracting, consumer finance, credit union mergers and governance. Gina also represents for-profit credit union service organizations (CUSOs) in areas including corporate structure, IP, data protection and privacy. Gina and her team advised the founders of CULedger, a technology company that sought to bring blockchain solutions to the credit union industry. The legal team organized CULedger and drafted a complex operating agreement that took into account state and federal regulations and the unique governance approaches of the company’s credit union owners. They also prepared a private placement memo that permitted CULedger to obtain the investment it needed to develop and market its blockchain products and services. Gina drafted licensing and other technology agreements with third parties that allowed technology development to proceed and ensured that the company’s intellectual property was protected along the way. Fundraising was successful, and today CULedger is on its way to developing applications using the power of blockchain to serve credit unions and their members. Gina led the trial team in defending a copyright infringement case against an international technology company that develops products and services for financial institutions in the developing world. The allegations centered on alleged copying of software used in ATM systems in Mexico and Latin America. While the case was brought in U.S. federal court, the majority of the witnesses and documents were in Latin America. After extensive discovery and proceedings that lasted more than two years, the federal court dismissed the case on summary judgment—adopting the argument Gina and her team advanced that the subject matter of the asserted copyright was not eligible for copyright protection under U.S. law. The court also adopted Gina’s arguments that key expert testimony the plaintiff offered was inadmissible. Prepared and prosecuted trademark applications including representing clients in proceedings before Trademark Trial and Appeal Board. Drafted and negotiated trademark, copyright, patent and multimedia licenses and nondisclosure and inventions agreements for range of companies, including financial institutions. Litigated trademark, copyright, patent, domain name disputes, unfair advertising, trade secret, antitrust, and franchise and dealership cases in federal district and appeals courts across the country. Conducted intellectual property due diligence for corporate mergers and acquisitions. Represented national companies and nonprofits in software audits by entities like Business Software Alliance. Drafted university and corporate technology transfer agreements and intellectual property policies. Drafted and negotiated complex software and other information technology licensing agreements on behalf of businesses and vendors. Advised financial institutions and other companies on data breach response procedures to minimize risks. Drafted and negotiated publishing and media contracts. Advised newspapers, magazines and broadcasters on all areas of defamation and libel including performing pre-publication reviews. Advised media on state and federal open records and open meeting laws. Advised media on intellectual property licensing copyright, trademark and rights of publicity laws. Represented credit union in largest-ever acquisition of bank branches in the United States. Advised credit unions on legal issues surrounding credit union mergers and acquisitions. Organized and advised credit union service organizations (CUSOs) on myriad business, licensing, regulatory and security issues. Negotiated and drafted IT and other vendor agreements and licenses for credit unions and CUSOs. Advised credit unions on patent infringement claims brought by "patient trolls." Counseled credit unions on website, e-commerce and intellectual property matters. Assisted credit unions in implementing complete rebranding of their institutions. Advised on range of credit union corporate governance and financial regulatory issues. Litigated complex commercial disputes for credit unions, CUSOs and credit union trade associations. Advised and prepared Hart-Scott-Rodino Premerger Notification Filings and provided antitrust advice to technology, healthcare and financial institutions. Represented range of companies and individuals in entertainment and publishing industries in connection with talent and publishing agreements and rights of publicity issues.